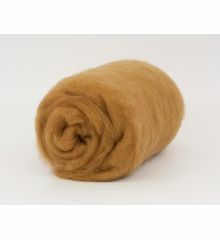 Carded wool :: Carded Wool Australian 26 mic. Home/Carded wool/Carded Wool Australian 26 mic. DarkGrey 26mic B105 carded, 50gr. DarkTurquoise 26mic B112 carded, 50gr. TurkishBlue 26mic B116-1 carded, 50gr. DarkGreen 26mic B139 carded, 50gr. ForestGreen 26mic B140 carded, 50gr. OliveDrab 26mic B154 carded, 50gr. DarkOlive 26mic B159 carded, 50gr. CanaryYellow 26mic B182 carded, 50gr. CanaryYellow B183 26mic carded, 50gr. Mustard B185 26mic carded, 50gr. Purple 26mic B210 carded, 50gr. Aubergine Melange 26mic B211, carded, 50gr.